Yesterday while recouping from my previous night of Baseling and deciding the schedule for Friday night I received a phone call from the casting directors for Magic City, the Starz television show that is filmed in Miami. The actor normally playing the doorman couldn't make it and they asked me to be the new doorman but I needed to be there in 20 minutes. Hah! What are they crazy? I said, no way could I make it in 20 minutes, 45 minutes maybe. So my journey began. I grabbed a few things and out the door I went. Traffic being what it is during Art Basel made getting there a breeze. Right! So I arrived an hour later. I rushed right to hair and got a fresh new '50s haircut. Then someone else rushed me to sign in and to get fitted for my doorman costume complete with hat. Next I was taken to makeup for a bit of powder, etc. Then I was rushed to a chair to wait. Filming is all hurry up and wait. After a bit I was escorted on the set, the Magic City set is incredible. 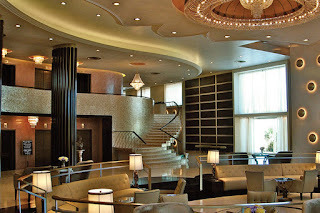 It looks just like a hotel lobby like the Fontainebleau or the Eden Roc. The director said I'd be opening the door for James Caan. So we rehearsed but no James Caan. There was a second unit that stood in for James Caan and his gang while I rehearsed opening the door for him and his gang. We rehearsed it several times until the director was happy then James Caan and the principles came for a rehearsal. After the first rehearsal James Caan, everyone called him Jimmy, had a little discussion with the director, Simon, and we rehearsed again with a few changes. When everyone was happy with the rehearsal we took a break so the principles could get in costume. Then everyone, and I mean everyone who worked there, came on the set. Prop people were passing out cigars, period glasses, cocktails and such to the extras. Makeup people were coming by checking everyone's makeup. Wardrobe people were pulling jackets down and checking ties. A guy was walking around handing out little bottles of water and waiting while you drank it since you couldn't put the bottle down on the set. Set decorators were cleaning the glass of the door I was going to open. Someone else was passing out little pads to the extras in case they started sweating. It really takes a village to film a TV show. Just when I thought we were going to start, the director called for another rehearsal with a stand-in for James Caan. 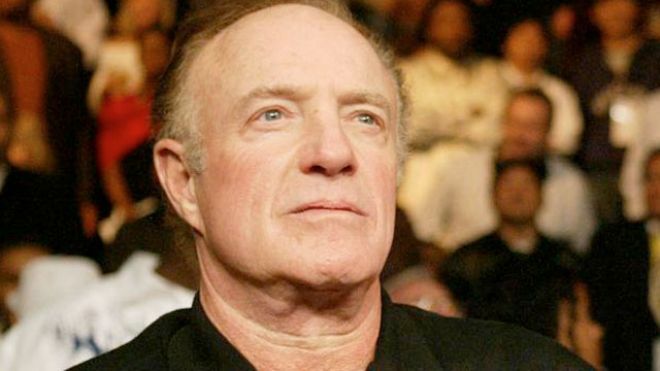 When he was happy James Caan and his gang came on set and we rehearsed once again. Then the director asked for one more rehearsal but said to "Jimmy," should we shoot this rehearsal? He said of course, so the next rehearsal was shot. Then we did the scene over and over. I must have opened the door for James Caan a dozen times. Sometimes "Jimmy" would says thanks, one time he gave a little nod, and another time he totally ignored me. Every time was a little different. Following James Caan were his cigar-smoking thugs since he plays the part of the head of the Chicago mafia. When the scene was finished there was applause and James Caan disappeared. The next scene was shot up in the hotel's office so I had no doors to open and just watched. After that scene was shot they sent us back to the holding area near wardrobe and told us to wait. After 20 minutes someone announced that we were wrapped for the day. More applause. Back to South Beach I kept texting my friends to decide what Art Basel events I would attend. Once I was home and seated, something I hadn't done all day, I decided that the only art I wanted to see that night was hanging on the walls of my apartment but alas, there were still two more days of Basel.